THE DORSEY OPENS AT THE VENETIAN: The Dorsey, which replaced The Bourbon Room, is a new visually stunning cocktail bar at The Venetian® offering a subtly sophisticated atmosphere. The new lounge is designed to feel like a home away from home. 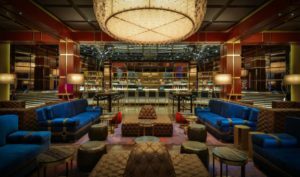 The concept is led by F&B impresario David Rabin and barman Sam Ross of New York speakeasy Attaboy. The Dorsey is open nightly from 2 p.m. until 4 a.m. and is conveniently located on the casino floor adjacent to Restaurant Row. The 4,500-square-foot space features rich materials throughout, such as French oak, brass, leather and marble, while the millwork exterior incorporates mahogany and brass. Intimate seating options encourage social interactions such as a separate library space with a lustrous modern fireplace as the focal point. The Dorsey also incorporates stunning digital art displayed on eight screens from artists such as Marilyn Minter, Poyen Wang and Jason Salavon. The full-service bar has an inventive cocktail menu designed by award-winning barman Ross and manned by top drink makers. There are signature cocktails, including shareable punch bowls. Some drink highlights include: the Penicillin, which the “New York Times” named to its list of 11 essential drinks of the “modern cocktail revival;” Let’s Elope; East Side Rickey; A La Louisiane; Coney Island Express; Creole Punch; and much more. The Dorsey also boasts a full-service bar with a collection of spirits, beer and wine. 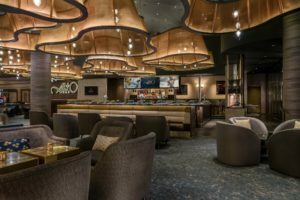 ALTO BAR INTRODUCES STRIP’S FIRST VIRTUAL REALITY LOUNGE: Alto Bar, the newest destination and largest bar at Caesars Palace located adjacent to Omnia Nightclub, is introducing Las Vegas’ first Virtual Reality Lounge featuring Oculus Rift for a limited time through Feb. 28. Located in the private space at Alto Bar, the Oculus Virtual Reality Lounge is featuring four Oculus Rifts with Touch, taking guests on a fully immersive 360-degree experience with a variety of the most popular VR games available. From 4 p.m. to 2 a.m., Oculus Rift and Touch provides guests the ability to manipulate objects and gameplay elements in VR with extraordinary precision. STYX AND DON FELDER PLAY FIVE NIGHTS AT THE VENETIAN: Rock legends Styx with special guest star Don Felder-formerly of the Eagles-will appear for an unforgettable five-night limited engagement at The Venetian Theatre. The show, “Styx & Don Felder: Renegades In The Fast Lane,” will be held on Jan. 6, 7, 11, 13 and 14. 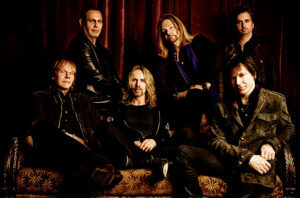 For these special performances, Styx–Tommy Shaw (vocals, guitars), James “JY” Young (vocals, guitars), Lawrence Gowan (vocals, keyboards), Todd Sucherman (drums) and Ricky Phillips (bass), along with the occasional surprise appearance by original bassist Chuck Panozzo-has created an exclusive set list and brand new stage production. Felder is also working on some plans of his own for the residency. The multi-show run will pay tribute to both Styx and Don Felder’s combined 45-plus years as one of the most successful rock and roll bands in history and one of rock’s most illustrious guitar legends. GAMEWORKS DEBUTS XD DARK RIDE EXPERIENCE: GameWorks located next to the movie theater AMC 18 at Town Square has debuted a multi-sensory adventure ride. The XD Dark Ride takes participants on an adrenaline-charged interactive journey complete with real-time 3D graphics, motion, lights and sound. Each player uses a “light gun” attached to each seat to obtain high scores in various adventures including Alien Asteroid, Forbidden Mine, Zombies, Gigamon and Pirates. This is TRIOTECH’s first XD Dark Ride interactive theater in Las Vegas. The ride accommodates up to eight riders at a time and costs $7. XD Dark Ride received an award from the International Association of Amusement Parks and Attractions (IAAPA) for “Best New Product” in the category of Family Entertainment Centers. 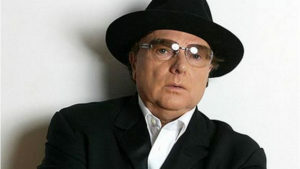 VAN MORRISON PAYS A VISIT TO THE COLOSSEUM: Rock artist Van Morrison will stop at The Colosseum at Caesars Palace on Jan. 13 and 14 with performances at 8 p.m. Tickets range from $56.50 to $257. Raised in Ireland, Morrison grew up on his father’s collection of blues, country and gospel music and by the age of 13 was working as a travelling musician playing guitar and saxophone in several bands. In 1964, he formed the group Them, which went on to record the hits “Gloria” and “Here Comes the Night.” A few years later, he released the Top 40 pop sensation “Brown Eyed Girl” and began his solo career as a musician. He has since released more than 30 albums. MANY ‘AMERICA’S GOT TALENT’ CONTESTANTS LAND IN VEGAS: Whether passing through Vegas or landing a permanent gig, “America’s Got Talent” (AGT) contestants often infiltrate the city’s entertainment landscape. Most famous is ventriloquist Terry Fator who has headlined at The Mirage more than 10 years and Mat Franco, who was AGT’s first and only magician to win in the show’s history, has been starring in his own show at the LINQ. 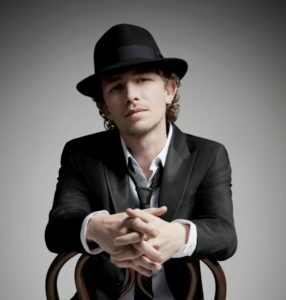 We often see Michael Grimm, the NBC’s hit show’s fifth season winner, around town at different locations. 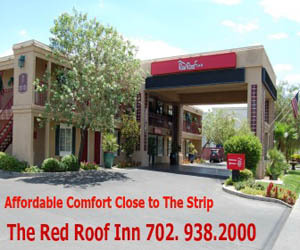 He’s booked the first Friday of every month this year in the Rocks Lounge at Red Rock beginning with Jan. 6. He’ll be appearing at Bailiwick at The Orleans Jan. 7 and 2, Feb. 4 and 18; The Martini in Summerlin on Jan. 28; and the House of Blues at Mandalay Bay with no cover on Wednesday, Jan. 25. 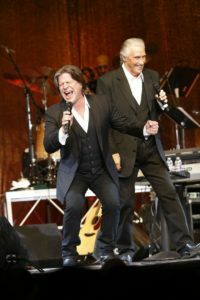 Grimm with his Southern manner headlined the first-ever national “America’s Got Talent Tour” and followed it by touring with the legendary Stevie Nicks and Heart playing to arenas of 20,000. AGT show finalists Piff the Magic Dragon with his famous dog Mr. Piffles has been performing in Bugsy’s Cabaret at the Flamingo when he’s not touring and now he’ll be sharing the room beginning Feb. 22 with a finalist from this past season Tape Face. One became famous wearing a dragon costume and the other for never talking and having black tape over his mouth. It appears Las Vegas is a perfect destination for many AGT acts. TENORS OF ROCK STARTING RESIDENCY AT HARRAH’S: “Tenors Of Rock” comprised of five blokes from the UK will begin a regular gig at Harrah’s Showroom on Wednesday, Jan. 11 and run weekly though Sunday with shows at 8 p.m. Tickets range from $35 to $99. Tenors Of Rock are bringing reimagined versions of some of the most beloved rock anthems and biggest songs of all-time to life in a fresh twist on the traditional rock show. Powered by five burly British frontmen backed by a full band and choreographed dancers, the all-new production will feature dynamic and harmonically complex renditions of treasured songs from groups like Aerosmith, Queen, AC/DC, Bon Jovi, The Rolling Stones, and more. 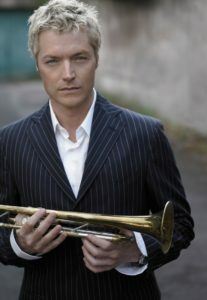 CHRIS BOTTI BRINGS JAZZ TO RED ROCK: Chris Botti will appear in concert at the Red Rock Ballroom on Saturday, Jan. 28 at 8 p.m. Tickets range from $35 to $75. Botti has become the largest-selling American instrumental artist since the release of his 2004 critically-acclaimed album “When I Fall In Love.” His success has crossed over to audiences usually reserved for pop music and his ongoing association with PBS led to his four No. 1 jazz albums. 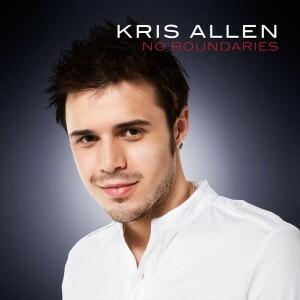 His album “Impressions” won a Grammy Award for “Best Pop Instrumental Album” in 2013. CAESARS VEGAS RESORTS WILL CELEBRATE YEAR OF THE ROOSTER: Chinese New Year is recognized as the most important Chinese holiday and the sixth annual Chinese New Year in the Desert™ will celebrate the year of the rooster in multiple locations over a four-day period from Friday, Jan. 27 to Monday, Jan. 30. Participating Caesars Entertainment venues will include: The LINQ Promenade, The Forum Shops at Caesars Palace, Miracle Mile Shops at Planet Hollywood and The LINQ Theater. The LINQ Promenade will have the Dragon Dance and Chinese cultural performances from 6-9 p.m. on Jan. 27 and 30 and from 1:30-9 p.m. on Jan. 28-29 with appearances by professional dancers from Sichuan dance troupe and local Chinese communities on the Fountain Stage. Dragon dance performances by Lohan School of Shaolin will be held nightly at 6 p.m. The High Roller will be lit red and gold to mark the beginning of the festivities on the night of Friday, Jan. 27. The Tsingtao Beer Tasting will allow visitors to taste the Lunar New Years-themed cocktail or sample beer from Tsingtao, the second largest brewery in China, at the Tsingtao booth at The LINQ Promenade. There will be live large-scale spray paint shows by Visual Art Images and the Chinese New Year-themed artwork will be for sale at a special rate at The LINQ Promenade. 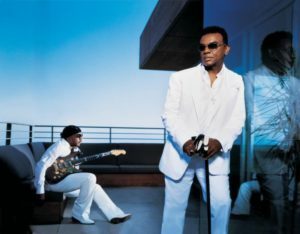 There will be a Chinese New Year Celebration Gala at The LINQ Theater on Sunday, Jan. 29 from 2:35-3:30 p.m.
ISLEY BROTHERS WILL HEADLINE STAR OF THE DESERT ARENA IN PRIMM: Rock & Roll Hall of Fame inductees The Isley Brothers will appear live in concert on Saturday, Jan. 21 at 8 p.m. at Star of the Desert Arena in Primm, Nev., which is only 25 miles south of Las Vegas. Tickets start at $30 with room packages including two concert tickets and a one-night stay at Buffalo Bills available starting at $109.95. The Isley Brothers, Ronald and Ernie, made their initial mark on the music scene with their first million-selling single “Shout” in 1959, which they wrote. During the group’s early music career, they brought Jimi Hendrix and Elton John on tour before each musician pursued their own solo musical paths. Other Top 40 hits by the brothers include: “Twist & Shout,” “This Old Heart of Mine,” “Who’s That Lady,” “Summer Breeze,” and the Grammy Award smash tune “It’s Your Thing,” recorded on their own label T-Neck Records. As mentioned before…at The Venetian, the French-American db Brasserie restaurant will close with the final dinner service on Sunday, Jan. 8. Meanwhile, it will be open through Tuesday, Jan. 3, closed Jan. 4-7 for a private event, and then the last night Jan. 8. 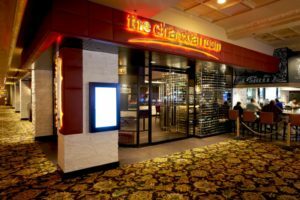 The Charcoal Room at Palace Station will host a five-course dinner pairing with wines from Kendall-Jackson winery on Feb. 2 from 6-8 p.m. The dinner will feature a wine expert from the Santa Rosa, Calif.,-based Kendall-Jackson winery. Cost is $55, 702-221-6678. ENDING 2016 WITH MANY SHOW CLOSURES: Many shows closed in Las Vegas this past year. Some were long-running shows like “Jubilee” at Bally’s, “Jersey Boys” at Paris, Matt Goss at Caesars Palace, “The Improv at Harrah’s, “Zarkana” at Aria, and Gordie Brown at the Golden Nugget. Still other shows may have closed but either the show or its stars show up around town and have a following. Some of those shows were: Dirk Arthur’s “Wild Magic” at Westgate, Frankie Moreno’s “Under the Influence” at Planet Hollywood, Zowie Bowie at Downtown Grand, “Tony n’ Tina’s Wedding” at Bally’s Windows Showroom, and “Country Superstars” at Hooters. One of “America’s Got Talent” winners, ventriloquist Paul Zerdin didn’t last long with his “Mouthing Off” at Planet Hollywood even though it was a good show. There just may not have been enough room in town for an extra ventriloquist especially since Jeff Dunham headlines on and off in town and will bring his “Perfectly Unbalance” show to The Colosseum at Caesars Palace beginning March 8. 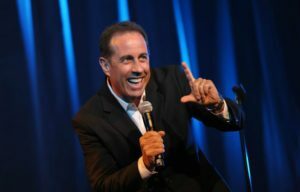 He will return for 14 consecutive weeks, with one show a week from June 16-Sept. 13. Plus another famous ventriloquist Ronn Lucas occasionally plays Las Vegas. The most recent show closures were: “Million Dollar Quartet” at Harrah’s on Dec. 4; “Showstoppers” at Wynn on Dec. 31; and “Rock of Ages” at the Rio on Jan. 1. While “Raiding the Rock Vault” closed at the Tropicana, it will be opening again at the 650-seat Vinyl room inside the Hard Rock on March 11 with shows Saturday to Wednesday at 8:30 p.m. The new location may be a perfect fit for this ultimate rock concert experience featuring members of some of the greatest rock bands in history. Didn’t get the notice in time; however, Noelia’s concert originally scheduled for Thursday, Dec. 29 was postponed with a reschedule 2017 date TBD. The famously irreverent glam metal rock band, Steel Panther with front-man Michael Starr performed at Drai’s Nightclub atop The Cromwell last Nov. 17 and they will return on Thursday, Jan. 19. Hailing from Los Angeles, where they racked up the longest-running residency ever on the Sunset Strip, Steel Panther has taken sold-out arenas around the world by storm. GRACEDBYGRIT, a high-performance women’s athletic apparel company in Tivoli Village, will host a “Gritty Girls Weekend” for young girls and teens. The complimentary Las Vegas Girls Empowerment Exhibition from 2:30 to 6 p.m. on Saturday, Jan. 7 hosted at Lorenzi Park will feature a tennis exhibition with junior professional tennis player Zoe Scandalis and other young athletes; team games; guest speakers; gift bags; and a girl’s dance party. On Sunday, Jan. 8 there will be a self-empowerment workshop, GRITTYGIRLS, from 3 to 4 p.m. Cost is $15.